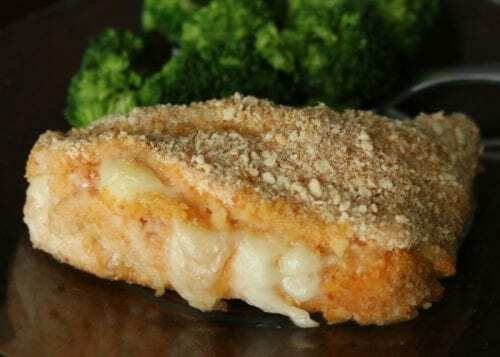 Commit to homemade meals with delicious and easy Chicken Cordon Bleu Recipe with Creamy Dijon Sauce. 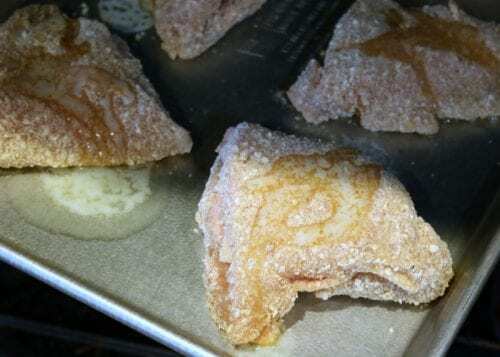 An easy DIY recipe tutorial idea. This year I have committed to making more homemade meals for my family to enjoy. Life is busy, which is exactly why it is so important to gather around the table and share the stories of the day. Another nice part about cooking at home is that I can make sure there is enough extra so that hubby has a lunch to take to work the next day too. It’s a win-win! 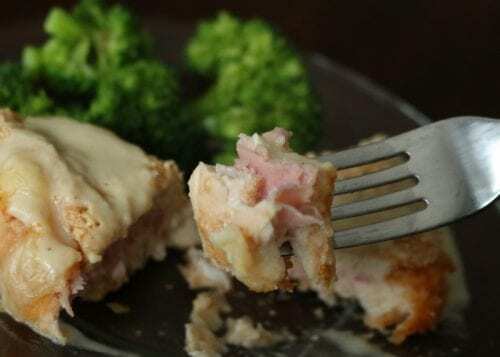 Chicken Cordon Bleu is one of my favorite things when we eat out, but I can still enjoy it at home too! 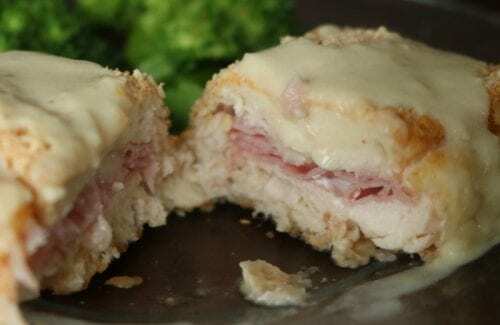 This Chicken Cordon Bleu really is a super simple recipe and can be on the table in less than hour, and that’s including prep time! The key to restaurant quality Chicken Cordon Blue are the ingredients. They must be top notch. That is why I go with Castle Wood Reserve®. They have a full line of premium deli meats that that are delicious alone, on a sandwich or many of your favorite recipes! 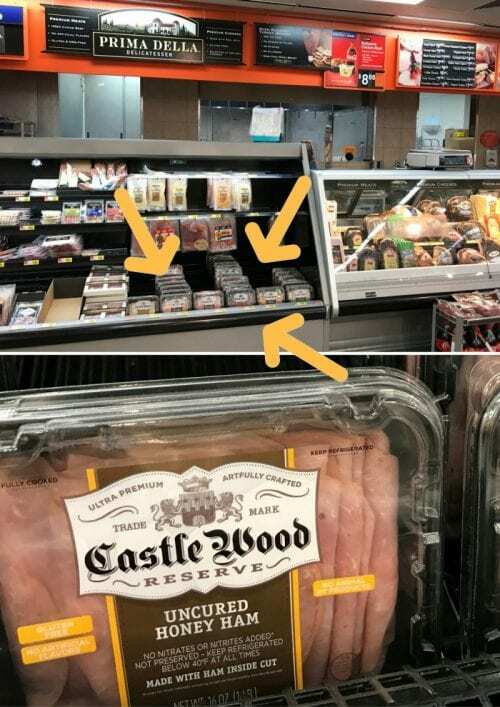 Castle Wood Reserve® meats are found near the deli counter. Here you can see where I found it at my local Walmart, right next to deli not near the regular sliced/packaged meats. 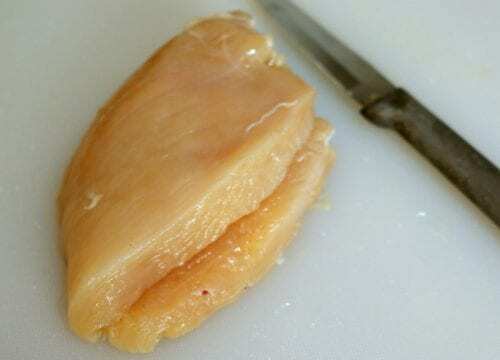 Depending on the thickness of your chicken breasts you may want to hammer them out a bit. The breast should be no thicker than about an inch. My chicken breasts were quite large so I also cut them in half to make more of a normal serving size. 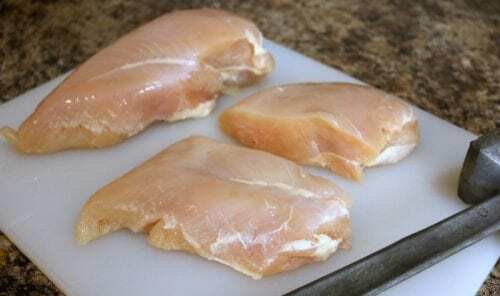 To butterfly the chicken, lay the chicken breast on a cutting board and with your hand flat on top of it, use a sharp knife to slice into one side of the breast, starting at the thicker end and ending at the thin point. Be careful not to cut all the way through to the other side. 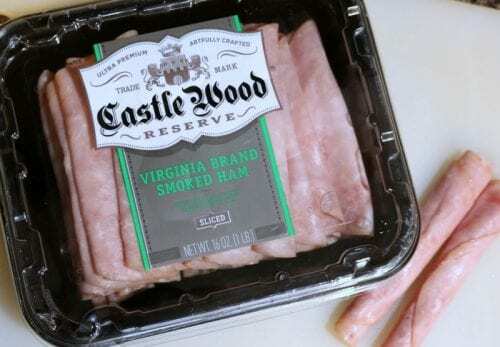 Open the chicken breast and layer the Castle Wood Reserve® Ham and swiss cheese. Add 1 to slices of each. I prefer more meat and cheese stuffed inside so I do 2 slices of ham folded over and 1 whole slice of swiss cheese cut in half. Fold the top of the breast back over and secure in place with halved toothpicks. Try to keep the ham and swiss cheese tucked inside the breast when securing the toothpicks. 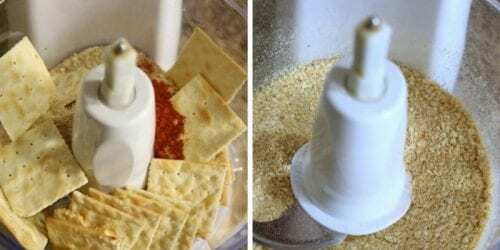 In a food processor combine saltine crackers, bread crumbs, paprika, and lemon pepper. Pulse the machine until all ingredients are well combined and the crackers are well crushed. *If you don’t have a food processor you can combine all ingredients in a gallon size zip bag and crush with a rolling pin until well combined. 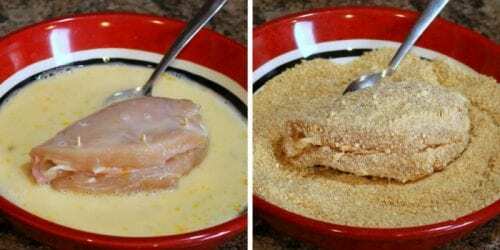 In one bowl combine the egg and milk mixture, and in another bowl pour the breadcrumb mixture. Dip chicken, one at a time into the egg mixture, then roll in the cracker mixture. Spray a cooking sheet with oilspray before laying the chicken onto the sheet. Drizzle chicken with with the melted butter. Bake at 350 degrees for 35 to 40 minutes, or until golden brown and just cooked through. Rest for 5 minutes before serving with the Dijon Cream Sauce. Melt butter over medium heat in a small saucepan. Add flour and cook for 1½ minutes. Remove from heat, stir and add salt and pepper to taste. Serve with chicken. When the chicken comes out of the oven it will be golden brown and you will see melted swiss cheese that as melted and oozed out the sides! 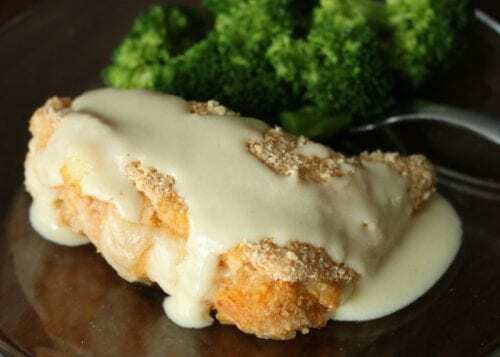 If you would like, spoon a little of the creamy dijon sauce over the Chicken Cordon Bleu. The sauce adds a bit more flavor and helps keep the chicken nice and moist. Cut into the chicken and you’ll see the Castle Wood Reserve® Ham and swiss cheese! Then there is nothing left but to take a bite and enjoy! If all meals are this easy to prepare and taste as good, then my commitment to making homemade meals is going to be much easier to stay on top of! Spray cooking sheet with oilspray before laying the chicken onto the sheet. Drizzle chicken with with the melted butter. Do you have a favorite recipe that uses deli meats? Share and leave a comment below! 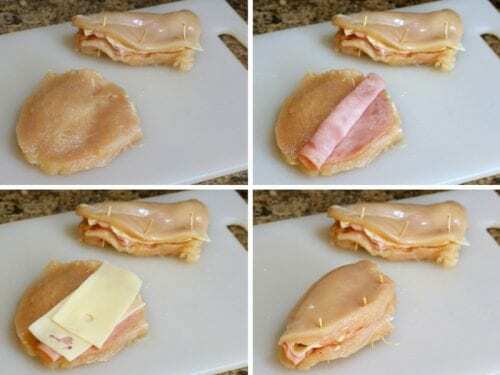 SAVE THIS EASY CHICKEN CORDON BLEU TO YOUR EASY DINNER IDEAS PINTEREST BOARD! This looks fantastic. I can’t wait to try them. Thank you for sharing on Wonderful Wednesday Blog Hop. Thank you Amy! Thanks for the fun party where I can share my recipes. This looks so delicious! I pinned it to try for dinner one night. Thanks! I’d love to know what you think after you’ve tried it! My best friends favorite meal is Chicken Cordon Bleu. So this looks easy enough for me to make it for her birthday next week. She will love you for it, Janet! Tell her her Happy Birthday from me! Ill let you know what she thinks also. I’m making it tomorrow Saturday 2/11/17 even tho her birthday is today. Better late than never. Oh, no! That is kind of important information, isn’t it! Thanks, Laura. It is 350 degrees for 35 to 40 minutes. I have added it to the recipe. Thanks again!